Last month the good doctor brought us up to date on the latest dyno models and how six-speed Harley transmissions affect dyno testing. This month he explains the operation of the often-misunderstood oxygen (O2 ) sensor-based, closed-loop fuel-injection system that was rolled out on the Dyna models in 2006 and has been standard on all Harley models since 2007. LAST AUGUST, I HAD ONE OF THOSE ONCE-IN-A lifetime experiences. My dyno was set up where I’ve run it for years, a few miles east of Sturgis at an intersection just across the way from the Full Throttle Saloon. On the evening of Friday, August 7, that intersection must have been the epicenter of a killer Bike Week hailstorm. The dyno survived, but my pickup and slide-in camper took a beating. The camper was totaled, and the truck extensively dented. Some timely phone calls got me a new windshield, but by Daytona Bike Week 2010, I still hadn’t gotten the dents fixed. Harley’s Delphi antiknock ignition system is a basic, closed-loop feedback system. Any detonation is detected and eliminated within a few engine revolutions. At Daytona, I came across Wayne Walker, aka the Dent Ranger. Turns out he rides a 1999 Indian Chief that was running poorly at the time, to say the least. His expertise is paintless dent removal; mine’s tuning motorcycles. Guess you can see where this is going. The Dent Ranger had spent good money at various bike shops only to have the Chief running about as good as a papoose. The bike looked great, but the jetting was way too rich, so I adjusted his S&S Super E down four jet sizes. Afterwards, the bike ran well on the dyno and, according to Wayne, was “running better than it ever has.” He then questioned me about the jetting. Wayne said the 74 jet the Super E had in it was the normal jet for the bike, which was info that probably came from one of the guys who tuned it before. I explained that the jet I put in was spot-on for the restrictive stock muffler on the bike. The normal jet killed the Indian’s performance in the same way closed-loop fuel injection can take the life out of Twin Cams and Sportsters. In stock form, they’re often anywhere from a little to a lot lean, making them run hot, sluggish, and far from perfectly. In my opinion, every single one needs tuning, but dealers say they’re running normal. I call it EPA normal and in need of treatment. True, many of the therapies I’ll mention will be for racing, off-road, and closed-course applications, but in many cases, we’ve already stepped over that line simply by changing mufflers or air cleaners. If you don’t understand this O2 sensor, open- and closed-loop stuff, you’ll be a sucker for guys who use them as buzzwords with the intent of opening your wallet. Let’s start the lesson by taking a look at another closed-loop system that does its job so well on Twin Cams that we rarely even notice it: the antiknock ignition system. It has several inputs, as shown in the diagram above. From them, the ignition section of the bike’s electronic control module (ECM) continuously outputs the proper spark advance and timing from its advance charts. So far, we have a basic system that works well, but can’t optimize timing for fuel octane or compression changes. To achieve that, we add what’s known in electronics as feedback, where a sample of the output is fed back to the processor. When drawn on a diagram like the one here, the information flow looks like a circle or a loop. It’s called closed-loop to distinguish it from open-loop, which is when feedback is not used. 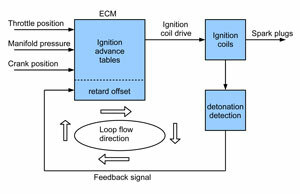 In the closed-loop ignition system, the feedback signal is generated by a detonation detection circuit and used to retard the ignition system as needed. The process goes on continuously and is unnoticed by the rider, except when he may hear a momentary pinging as the system adjusts to load and throttle changes. Wouldn’t it be nice if the fuel system was as transparent? The fuel system adds head and intake air temperatures as inputs to the ECM. Throttle position is measured at the throttle body on the engine (2008 and later Touring models have an electronic throttle so the position may lag in the rider’s throttle hand). 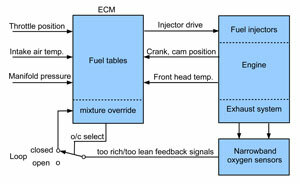 The top section of the fuel system diagram below shows the system used on all non-O2 Delphi EFI Twin Cams. The cam position sensor times the injector pulse and the fuel tables set the fuel injector’s pulse length and, therefore, the volume of fuel injected. The fuel tables are lists of pulse lengths based on throttle opening, manifold pressure, and engine rpm. When combined with the ignition tables, they’re often called maps because the ECM is constantly moving around on them as the bike is ridden. The basic fuel tables are set to produce air/fuel ratios (AFRs) of about 14:1 at low throttle openings, gradually getting richer as the throttle is opened to 13:1 at full throttle. This gives good fuel mileage, responsive performance, and maximum horsepower. The intake and head temperatures offset the tables, adding a little more fuel to keep the engine running smoothly when either the engine or weather is cold. Enter the O2 sensors and closed-loops in 2006. Why were they added? Some people will say they were added to help the bike adjust for weather and altitude changes. Absolutely not! As a matter of fact, as we’ll see shortly, the opposite is true. Plus, didn’t we just see that the pre- O2 system already adjusted for temperature? And altitude is automatically tracked since atmospheric pressure changes show up at the manifold pressure sensor. No, the O2 sensors were added for one reason only: to control exhaust emissions the same way they have on cars and trucks since the 1980s. They allow for that good old 14.7:1 stoichiometric AFR that yields the most complete combustion and thus minimum emissions. You may also see the 14.6:1 AFR used in various places. Close enough, they’re interchangeable. When I first wrote about going to 14.7 in the autumn of 2006, it seemed like a good idea. But, slowly, we started to see the downside: heat and lots of it. The summer of 2007, when the O2s made their way into all models, was a particularly hot one for new Harley owners. Owners were adding fans and oil coolers. They were going to true dual exhausts on Touring models just to get rid of the rear pipe’s heat radiation on the right side. When the Motor Company realized the scope of the heat problem, it added the parade mode, which shuts down the rear cylinder at idle. Then, in 2009, Harley routed the exhaust under the frame. The problem is that the heat source is still there, and the air-cooled engine has no good way to control it or, as I say, to turn off the toaster. This is the ECM fuel section used on the 2006 Dynas and all models from 2007 to present. In closed-loop mode the O2 sensors override the fuel maps that otherwise would compensate for temperature and altitude. Let’s look again at the fuel system diagram to see what’s happening. At the bottom are the O2 sensors, one per cylinder, the same kind found on most cars. They’re mounted in the exhaust pipes where they detect the amount of O2 in the exhaust gases, a direct measure of the AFR during combustion. The sensors are referred to as narrowband because their output changes very little in the AFR outside the narrow range of 15:1 to 14.2:1. It would also be accurate to call them switches since they effectively toggle on and off abruptly as the 14.7:1 ratio is crossed. I labeled their output too rich/too lean because in operation, the fuel system can’t actually maintain the 14.7:1 ratio so it’s continually hunting. 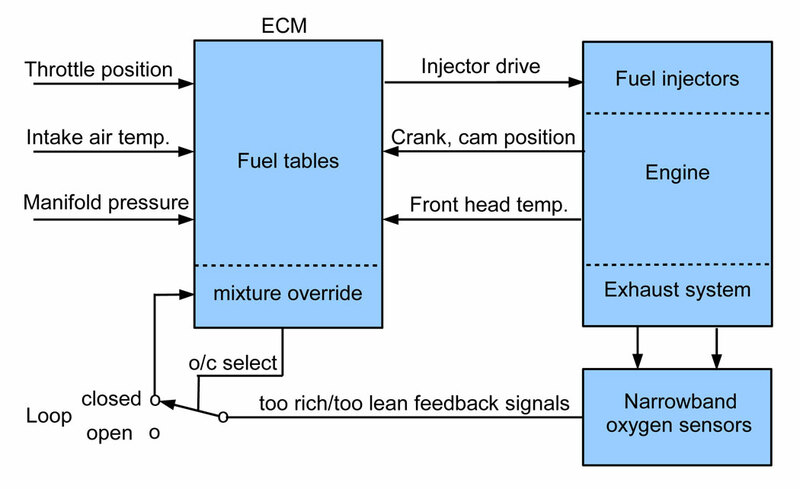 If the mixture is detected as leaner than 14.7, the ECM responds by adding fuel at the injectors. That makes it too rich at the exhaust, so the ECM reduces fuel. Once the loop is closed and this hunting process starts, the loop is referred to as locked, and it repeats continuously as long as the loop is closed. This hunting approach may seem somewhat peculiar, but it’s the way it’s been engineered on cars for over 30 years. 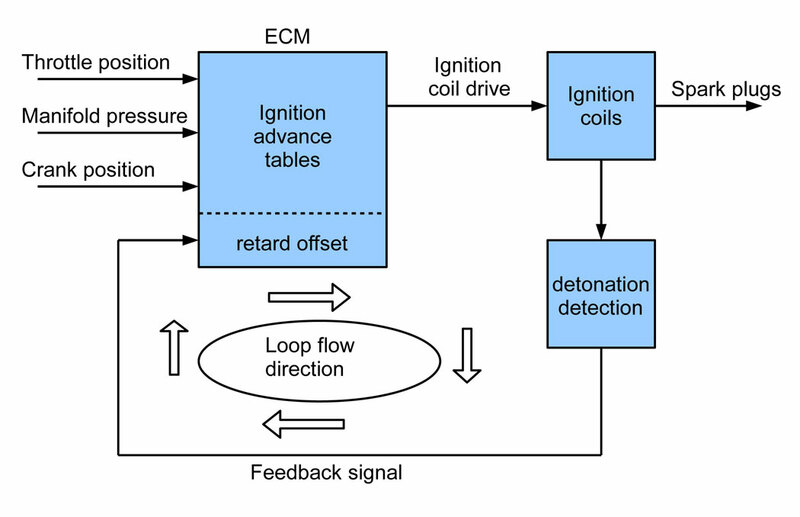 As for the feedback, instead of it resulting in offset as on the ignition system, it results in what I call override. In closed-loop mode, the O2 sensors don’t adjust the fuel maps. Instead, they completely take control away from them, causing the temperature and pressure sensors to have no effect either. Rather than compensate for the weather, as some claim, the closed-loop system ignores it. The bike runs lean to begin with, and, as one rider told me, the colder it gets, the worse it runs. That’s because it doesn’t get the extra fuel it needs for the higher density air. Under preprogrammed control of the ECM, the loop switch can be closed or open. The switch ends up in the closed position the majority of the time because the bike is most often idling or cruising. It’s open and running on the fuel tables for a short but important time during acceleration, and at what I call top end, which is above three-quarter throttle or three-quarter maximum rpm. During deceleration, the fuel should be turned off for minimum emissions, but Harley does not seem to do that all the time, resulting in the infamous decel pop. In any case, it’s open-loop on deceleration. The AFR graph below shows a 96" Road Glide running at about one-quarter throttle and making 25 hp during my cruise test. As I held it at about 1400 rpm, it ran closed-loop at 14.7:1. When I twisted the throttle one-quarter open, notice that the rear cylinder (red) went a little lean, running open-loop on its fuel table during the acceleration. Any leaner and we would have had a stumble. At a steady, one-quarter throttle, we can see the hunting action that averages to 14.7 as near as we can tell. Although the engine would be happier closer to 14.0, 14.7 isn’t too bad at quarter throttle and 25 hp. The problem is, it will still be that lean at three-quarter throttle while trying to make 60-plus hp. At those power levels, things get real hot, real fast due to serious fuel starvation. And look what happened when the ECM opened the loop at 4600 rpm. The front cylinder (blue) headed right for 13:1, exactly what we want to see, but the rear headed for meltdown. It’s interesting that at full throttle (not shown), which is open-loop at all rpm since it’s over three-quarter throttle, the rear cylinder AFR ran closer to the target 13:1 than the front. Does this mean the system learns, allowing us to change airflow components with impunity and it will adjust? Well, yes and no. As long as the changes are small enough, such as air filter and pipes, the system will still be able to achieve 14.7. However, that doesn’t change the fuel tables the hunting starts from, meaning it hasn’t really learned. With a large enough change, such as cams or cubes, not only will the open loop tables be way off, closed-loop lock may not be achievable either. What we’ve seen is that the O2 sensor equipped Twin Cam and Sportster models run in two separate and distinct modes, closed-loop on the sensors at idle and cruise, and open-loop on their fuel tables or maps on acceleration and at top end. If you can live with "normal," your bike’s engine can, too. And with synthetic oil, the engine won’t get hot enough to hurt itself. This typical AFR graph done at a 25 hp cruise shows the open- and closed-loop areas of operation. It’s lean at idle and cruise where it hunts for 14.7:1 and extra lean on the rear cylinder (red) at both ends. So what’s the plug-and-play quick fix? With our newfound smarts we should be able to figure this out, or at least separate the tuning products from their promises. This is an open-book test so feel free to review the material as many times as needed. Just be aware that every company’s ads tell you what the product is supposed to do, but never what it won’t do. How about what I call the O2 off-setters that plug into the sensor’s circuit and reset the AFR to 14.2:1 or 13.7:1? First, they work only during closed-loop, which means they can’t help an off-idle lean stumble or work at top end. But most of our riding is done at idle or cruise where they will work. Still, since they use the stock, closed-loop system, we’re stuck with one AFR from light to three-quarter throttle. However, 14.2 is definitely better than 14.7. An AFR of 13.7 is a little rich to get the best mileage, and it gets shaky because we’re working over the electronic edge of a narrowband sensor. This may have you asking “Why not simply replace the narrowband sensors with wideband ones that can accurately measure the whole range of AFRs?” There are two reasons not to. First, it’s not a simple swap since wideband sensors require an electronic interface box. Second, we’d still have only one AFR for the entire cruise throttle range. The right use for wideband sensors is with the autotune systems, but that’s for the next article (September). Street-legal tuning products are available for closed-loop bikes, but keep in mind that they only work in the open-loop area. Two such products are the Dynojet Power Commander III EX and the Vance & Hines Fuelpak EX. A description of Fuelpak EX I found on www.Fuelpakfi.com explains that it “works in conjunction with your motorcycle’s factory oxygen sensors and provides improved fuel delivery at higher rpm and throttle openings.” In a way, it explains what the Fuelpak doesn’t do: it doesn’t change idle or cruise because it doesn’t bypass the oxygen sensors. Occasionally, someone brings me a Harley with a PCIII-EX he bought because it was the newest model at the time, and it’s street-legal. I replace it with a PCIII-usb, install the O2 eliminators, and dyno tune the bike as if it was pre-O2 vintage. It’ll run perfectly, and anytime he wants it to meet emissions, the owner can simply reconnect the O2 sensors.